You knew cookies were coming this What’s Cooking Wednesday. I won’t be making the amount I did last year, but I can’t let Christmas pass without a few types of cookies. Mom trained me well! In fact, today’s recipe’s is my mom’s, although she always makes “Peanut Butter Blossoms,” which are peanut butter cookies with a Hershey’s Kiss nestled in the center. I’ll include those directions here as well for those who are interested, but since I didn’t have any kisses (of the chocolate persuasion), I went with the old-fashioned peanut butter criss cross kind of cookie. This is also my first of, I hope, two entries in Susan, the Food Blogga‘s Eat Christmas Cookies event. Last year I submitted Thumbprints, another *very* basic but delicious Christmas cookie. What can I say? Christmas cookies aren’t about fancy at our house; they’re just about YUM. 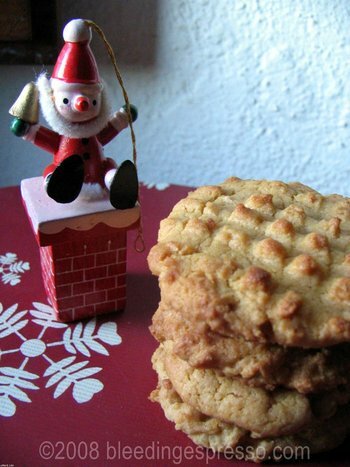 See lots of other great recipes at Susan’s Eat Christmas Cookies round-up here. 2. Mix shortening and sugars, and then add the egg and vanilla. Beat well. 3. Add in peanut butter. Blend well. 4. Add milk and mix in. 5. Mix together dry ingredients in a separate bowl. and add gradually to mixture. Mix well until a soft dough is formed. I do this last part by hand. 6. Pull off small chunks to roll into balls and then roll balls in sugar. 7. If you are making plain peanut butter cookies, put the balls on an ungreased cookie sheet and then flatten out with a fork, criss-crossing as shown in the photo. Bake for about 8-10 minutes, until cookies are lightly browning on top. 8. If you are making peanut butter blossoms, put the balls on an ungreased cookie sheet and bake for 8 minutes. Then remove and place a Hershey’s Kiss on top of each cookie, pressing and twisting slightly so that the cookie cracks around the edges. Bake for another 2-3 minutes. Let sit until chocolate cools. I love, love peanut butter and will definitely make this! Thanks for the recipe! Hee hee…still going strong here! Supposed to be a nasty day…perhaps I’ll do some more baking…. I just saw on CNN Int’l there is a big storm headed our way. Lots of rain and wind. Just started raining here…I hear it’s supposed to last all day and into tomorrow too. Christmas cookies, yum! Your recipe sounds great! Mmmm cinnamon stars…care to share a recipe? The cookies looks so beautiful and delicious pilled up like that. Thank you 🙂 They are definitely tasty! Oh , these are favorites! 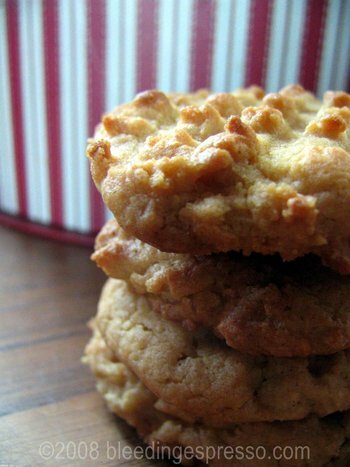 I’ve already made a double batch of peanut butter kiss cookies, and I’m told it’s time to make some more. Not sure if I could resist adding the kiss and serving them plain, but your peanut butter cookies look beautiful as well! Yum! I think I’ll try this recipe for a party my design class is having next week. Thanks! Gini’s last blog post..The Hugs Heal Shop Makeover and 3 Awesome New Designs! How did you get shortening in Italy? Do you bring it from home? *lowers head* My mom sends Crisco. Wow, those look absolutely delicious! This is definitely getting bookmarked and I’ll be giving it a try at the weekend! Nice job. How long before they are all gone?? You’re assuming there are still some here? Hah! Yes, the doggies *love* these…peanut butter hounds! What about an M&M in the center? I always serve peanut butter cookies with M&Ms scattered over them at my little guy’s birthday parties and the two taste pretty good together. Would that be a valid substitute? Oh, when I was a kid, I used to love to make peanut butter blossoms with Hershey’s kisses. Can you find a more kid-friendly cookie? And our Christmas cookies tend to be unfussy family favorites too. But that’s part of their charm. Thanks for this deliciously classic recipe, Michelle! Ciao! How far do you have to travel to find peanut butter in Calabria? I used to have people bring it to me from the States, but for the past year I’ve been able to find it at the supermarket locally! In the past couple years, it’s been showing up closer and closer to me! Most big supermarkets have it now (quite expensive, but it’s there)! Hah! Great timing! Now let’s see what we can do about this lottery thing…. Hope you like these too LuLu! I love how peanut butter cookies always have the fork print! YUM. You sure you can’t make more of these for our shopping day? You know we won’t find anything this good around here!! This is an excellent argument, Cherrye. Love that kind of holiday planning Karina! Funny thing, I have never made them for Christmas. I always have to try to something new for the holidays, this year being Lemoncello’s – from FoodBlogga, along with my traditional Zucchini Bread and Pecan Dreams. I think after the hollidays are over I am going to make a batch. Yummy looking cookies Michelle! Do you make cuccidatti ( fig cookies) too? I’ve never even heard of them Pat; they sound Sicilian? This post is killing me as they look just like the ones they used to serve at the school in my town and at our Board of Education meetings. Peanuts are now a no-no due to the advent of food allergies. Time for me to go buy some Nabisco peanut butter cookies. You can make a thumbprint in the cookies before you bake them and pipe or spoon some melted chocolate into the space after they have cooled. Not quire the same as a kiss, but just as good. I would send you some kisses but I don’t buy Hershey chocolate anymore. I am boycotting them! Good suggestion. I think I may have OD’d on the blossoms over the years b/c I actually really enjoy these without the chocolate now. I’m sure my tastes will change again in a few years. Yes, I remembered your Hershey boycott. I don’t have a choice but to boycott as their products aren’t sold here…. I think I like peanut butter cookies better without the chocolate. Maybe just because I love the criss-cross fork print; it’s one of those things that never changes. These are great photos too — wonderful composition and the cookies came out looking really crispy and light. My “standby cookie” tends to be chocolate-chip, but I seem to keep forgetting how delicious and easy peanut butter cookies are to bake. I think I’ll be baking some of these soon! I’m with you on the chocolate chips…coming Friday! Your pictures are so fun and pretty. What is your secret? Thanks Mary! I think the most important thing is natural light. With composition, my advice is to copy photos you like–you may not be able to put into words why you like them, but if you mimic the set-up, you’re more likely to end up with a good photo too. And for close-ups, don’t be afraid of your macro setting!